I´m an English teacher in Brazil. It´s an activity for young learners. 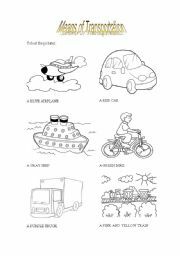 The child has to colour the means of transportation according to the color that is written. 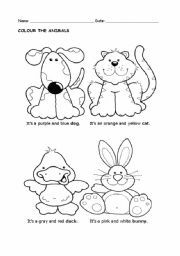 The student has to colour the animals with the colours that are written in the sentence. 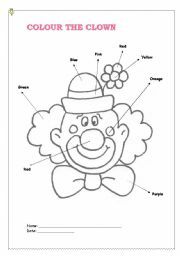 The child has to colour the clown according to the color that is written. The child has to complete the sentence according to the family relationship. 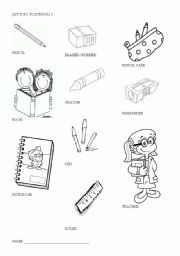 It´s some school vocabulary that children can learn and color the pictures. 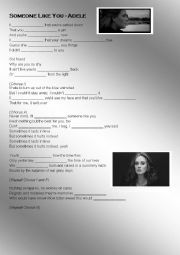 People need to complete the song with regular and irregular verbs in the past tense. I hope you enjoy it! It´s an exercise about animals. 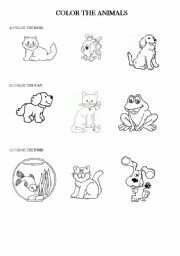 the child has to color the animals that is written on the sentence. Paint the lights according to the correct order of the traffic light. 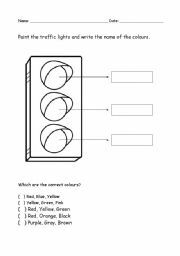 Then write the name of the colours on the box and answer the question, working the colours vocabulary. 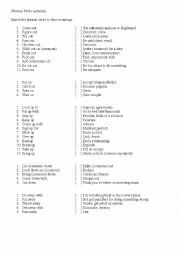 In this exercise you have to match the phrasal verbs with their meaning. 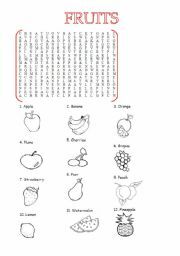 Students have to search the words and color the fruits.